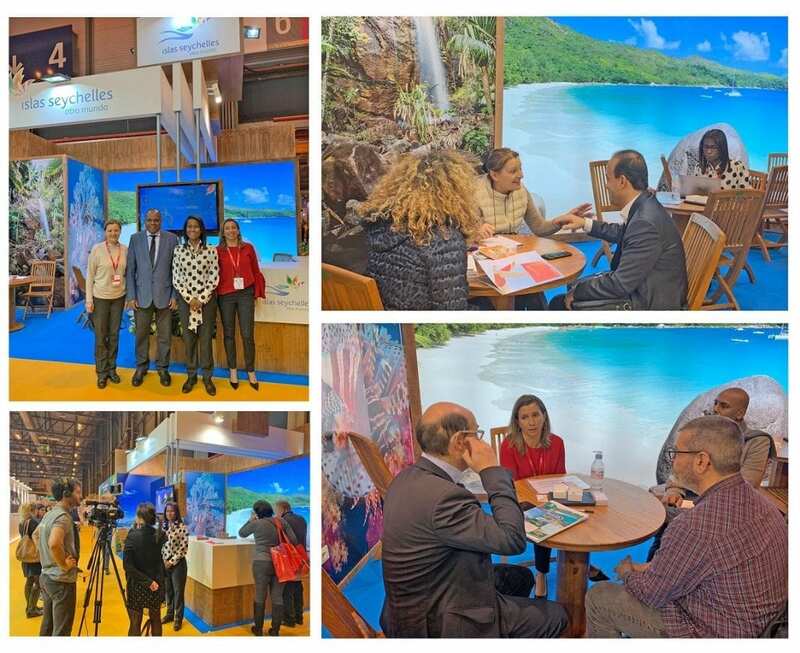 Destination Seychelles kicked off the year on a good note in Spain, as it makes its presence count at the International Tourism Fair organized by IFEMA, FITUR, held in the Spanish capital, Madrid from January 23, 2019 to January 27. Representing and showcasing the country was the Seychelles Tourism Board’s (STB) Regional Director for Europe, Ms. Bernadette Willemin, and Marketing Executive for Spain and Portugal market, Ms. Monica Gonzalez Llinas along with the Destination Marketing Company 7° South’s General Manager Mrs. Anna Butler Payette. The Minister for Tourism, Civil Aviation, Port and Marine – Mr. Didier Dogley – was also present at the Seychelles stand for the opening of the 39th edition of FITUR. The team representing the island archipelago were kept busy during the five-day long fair. Numerous meetings were held with travel trade professionals, press and media throughout the first three days. On Saturday and Sunday, Seychelles’ stall was transformed into a business-to-consumer platform, welcoming the public and all inquiries were attended to. The team worked closely with visitors on the stand in convincing them to travel to the exotic island nation. Business from the Iberian Peninsula is looking good. Last year the arrival figures to the Seychelles increased by 4 percent, with the Spain and Portugal market seeing a 10 percent increase, catering for the lion share of the business. Last year’s increase was immensely supported by both the Spanish and Portuguese trade and the local travel trade in the Seychelles. Ms. Willemin said that the current outlook for Spanish market in particular looks positive. “Should this trend continue, it will help in further developing our business together with the support of local Seychelles trade partners which will hopefully keep the growing confidence of the Iberians travel operators and agent in continuing to sell the destination and increase the Iberian sales figures,” said Willemin. Iberians are known to be very jovial people and good spenders, a market, which is very much in line with the Seychelles tourism development policy, quality versus quantity. Over 110,000 people from the public attended the show, which was covered by more than 7,800 journalists from all over the world. FITUR 2019 is once again the global meeting point for tourism professionals and the leading show for inbound and outbound markets in Latin America. The figures are proof of the show’s importance – the fair has grown by 8.3 percent and this year’s edition was the biggest ever organized. It saw the participation of 886 stand-holder exhibitors and more than 10,487 companies from 165 countries and regions.